So here is a screenshot of my Menu Bar that is always running. Click to expand to the full size. 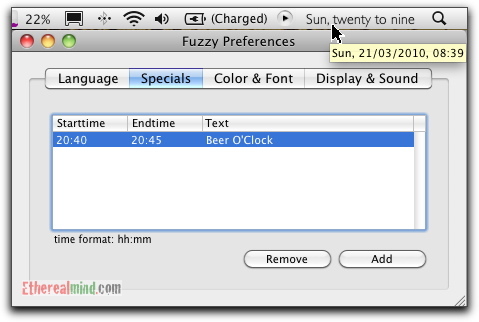 One of the programs in my tool bar is Fuzzy Clock. I don’t really think of the time at 20:03 or 1009. I like a literal presentation of “five past eight” or “ten past ten”. And that’s what Fuzzy Clock does. Pretty simple. You can download Fuzzy Park from here for free and it’s an offshoot of Object Park Development.